Welcome to Ten 3D Printable Things. Every week I’ll be showcasing ten fantastic and FREE 3D printable projects, designs and models from all over the web. This week I’ll be showcasing what I think is the most entertaining new trend in 3D model design, “hairy” 3D printable models! Late last year an enterprising 3D modeller discovered a clever way to create more realistic 3D printable hair using a simple sacrificial wall. 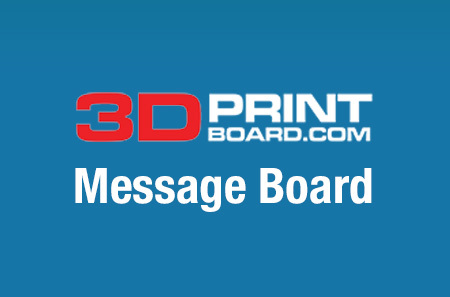 This allows individual strands of hair to be printed without causing misprints or complicated post processing. Once the model prints, the wall is simply cut away with a craft knife or a pair of cutters. Then the hair can be shaped and styled using either a hot water bath or a hair dryer. Once the basic design parameters of hairy models were set, naturally it didn’t take long for other designers to run with it. There is even a simple OpenSCAD script available that you can use to make your own. The result is a bunch of awesome hirsute 3D printable models, and I went and did all the hard work for you by tracking down ten of the best designs. This is, of course, the model that started it all, and it remains a great 3D printing project. The designer who released the first hairy lion (itself a remix of another lion model) has since released several different options, including a hollow version, a dual extrusion STL and multiple sizes. There is even a light up base that can really show off the final print. This simple unicorn bust is a fast and easy to print model that has a cool hairy mane. In addition to being a very quick print, the unicorn won’t need any supports and should be relatively hassle free. 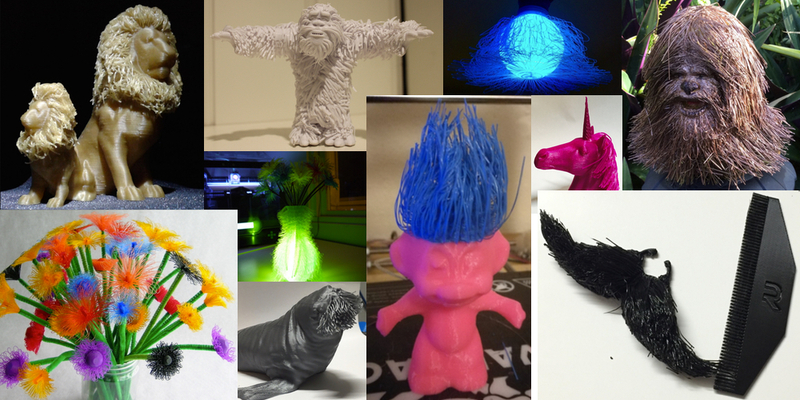 The designer has also included a dual extrusion STL so you can give your unicorn different colored hair. I know, a “hairy vase” sounds like a dirty joke of some kind, but it’s actually a real thing that you can 3D print. Why would you print a hairy vase? Well, first of all, some people like their vases hairy and some people like them smooth, don’t judge other people’s tastes. Secondly, because it’s a vase with hair on it. Tell me that you’re not a little curious. Obviously if you’re going to be printing yourself a hairy vase then you’re going to want some hairy flowers to go with it. This great OpenSCAD file allows you to custom create your very own unique hairy flowers in a huge variety of different styles and sizes. They can be used for a ton of different projects, and can be printed to be as crazy and off the wall as you want. And don’t worry, if you’re not very good with OpenSCAD there are a bunch of STL files available for download. It was only a matter of time before someone recreated the classic Troll doll toys from the ’80s and ’90s, and the results are pretty great. The model itself is a pretty fast print that shouldn’t give you any problems, although it will need a bit of support in a few places. The model was also designed so it can be stopped mid-print right before you get to the hair in order to swap filament out and give your doll different colored hair. You could also split the model into two parts and print separately in different colors, joining the troll again using some glue. This fantastic hairy walrus model is probably the silliest of the hairy models available, and it’s also probably my favorite. Not only because it bears a striking resemblance to me, but walruses are just fun. Depending on the size you print at, the model itself should print relatively quickly, but the furry lip may be a little tricky to style. The designer suggests that you use the hot water method and work slowly to avoid any breakage. Come on, you know this looks cool all lit up. For an even cooler look try 3D printing the lamp in a special filament, like a metallic or a translucent. This was, obviously, a no brainer. I would actually have been disappointed in the 3D printing community if someone didn’t make a hairy Chewbacca. Or, possibly a hairy Big Foot, honestly it could be either. Obviously you should print this in brown filament if you want Chewbacca as the hair would make it very difficult to paint. Sully! Or another Big Foot, it’s up to you. Again, print this in the correct color because painting it is going to be pretty difficult. The hair is also a little thicker than the rest of the models on this list but I think it works. This is for all you smooth guys who can’t ever seem to grow proper facial hair. Shave off the peach fuzz and 3D print yourself a macho mustache, it’ll put hair on your chest. Because all of the hair is made of separate strands you can style it any way that you want, You can do the classic Selleck, the Hogan, the Brimley or even the Chaplin*. And you don’t need to settle for one ‘stache, if you get tired of the style just get out the hair dryer and style it differently. *Don’t make a Chaplin. Seriously. As always, you can email me your feedback and theme suggestions, and I always love to see what 3D printing projects you’ve been working on. You can also find me on Twitter @SJGrunewald, so say hi and feel free show off what you printed. Tag it #103dpthings and you’ll get a RT.